Scottish fiddlers interpret traditional music different ways: some play all traditional session tunes note-by-note, others take basic elements of the style and write entirely new compositions, and yet others mix the two ideas into their own sound, playing both traditional tunes and originals. Jenna Moynihan does this in her new CD, Woven, while incorporating Appalachian bowing patterns as well as old-time cross tunings throughout the entirely instrumental CD. Moynihan is a graduate from Berklee College of Music and now tours with Laura Cortese and The Dance Cards. She incorporates many aspects of traditional fiddling, weaving them into a sparsely instrumented CD, mostly using only guitar, fiddle, and harp. One of the most unusual things about this fiddle CD is how much harp is featured. Harpist Mari Chaimbeul is on every track, and all the tunes are arranged with an interesting harmony between the harp and fiddle. This is demonstrated in a modern set of a tunes (track 6), the first written by Chaimbeul called Kendall Tavern, and the second called Dancing in the Alihies, written by Nollaig Casey. The harp takes the melody first and the fiddle comes in part way as back up. When the fiddle takes the melody, the harp alternates between accompanying the fiddle with long, drawn-out chords and note-for-note harmony, where the fiddle and harp have the same rhythm, but different notes. The harp also initiates the transition between tunes in the set, as well as a dramatic tempo change. Although the fiddle is prevalent in the second tune, the harp plays an interesting and fast harmony to the reel, again alternating between its own part that emphasizes the backbeats of the tune and a note-for-note harmony. The CD starts off with an original tune called Haven that captures the energy that Moynihan maintains throughout the rest of it. 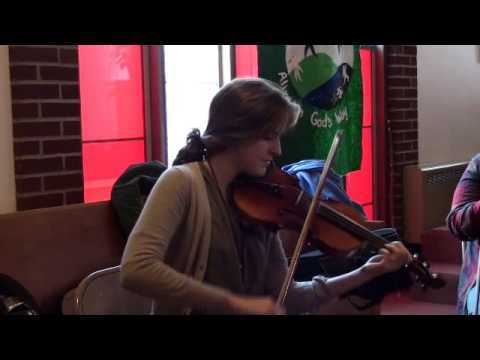 It is arranged for fiddle, harp, and guitar played by Courtney Hartman. It maintains its minimalist vibe from the beginning while only harp plays throughout the building of the track and fiddle and guitar are added. What makes this track stay interesting is the changes in what the guitar does for back up. Hartman is the last of the three to come in, and comes in playing a similar part to what the harp was doing before. The guitar changes to chords subtly, but as it alternates between soft and driving, as well as flat-picking and chord back up, the mood of the tune shifts, keeping the listener engaged. The second track on the CD incorporates many different aspects of Moynihan’s fiddling. The traditional set consisting of The Eagle’s Whistle and Major Campbell Graham, starts off with fiddle and harp harmonies that dominate most of the album, with a subtle drone in the background. The interesting thing about The Eagle’s Whistle is the emphasis throughout. It is a slow tune, but maintains a strong energy even through the long held-out notes due to the heavy emphasis on the backbeats. The effect is similar to the energy that Martin Hayes and Dennis Cahill use on their CDs, made stronger by the sparse instrumentation that both artists use. Owen Marshall on guitar comes in mid-way through the tune, and adds another dimension that keeps the tune from getting too repetitive. The drone is maintained throughout the set, and is used to transition from the slow Martin Hayes-y tune into a fast reel. Major Campbell Graham shows a different side of Moynihan’s fiddling, as the tune is played straight, using an Appalachian bow pattern that helps drive the tune by emphasizing the back beats. The only thing that I miss on the second tune is the harp harmony, as the guitar takes the harp role over by alternating between strong, driving backup and flat-picked harmony. The drone and the guitar maintain a rounded sound that covers up the harp, but the energy is still there. Overall, the album took traditional Scottish styles of playing and used styles from traditional American music to weave an original sounding CD.